Facebook’s platform is now home to 1.79 billion users (billion!) – about 1.2 billion more than the next-largest social media network. Ads on the platform enable your business to show up exclusively to your target market, in your target location, for significantly less than Google Adwords – that makes it a perfect platform for small business. Beyond incredible reach, Facebook is the leading ad platform for the mobile market. More than 80% of Facebook Ad revenue comes from mobile ads. If you have a target market which is often on their mobile (millennials and teens, particularly) Facebook may be the #1 platform for you to reach them. 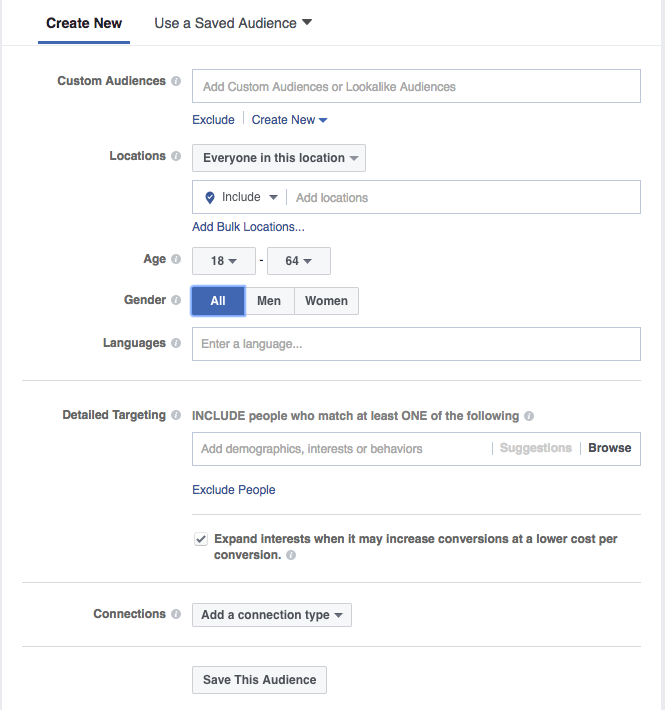 Facebook Ads are centered around unparalleled targeting capabilities. The platform enables advertisers to leverage every piece of information (explicit and implicit) we put on it. 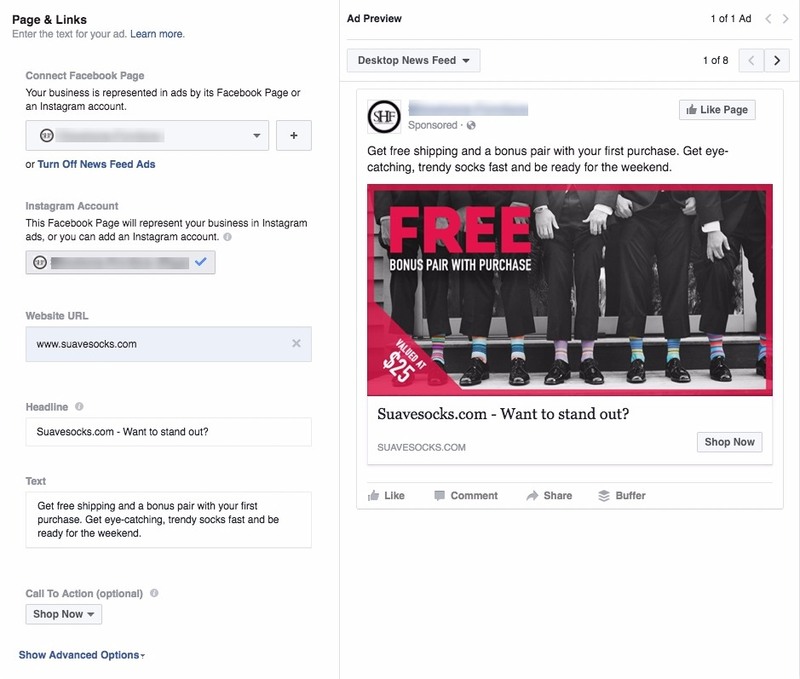 This article will give you a step-by-step guide to getting started with Facebook Ads and provide you with the resources you need to go from here. One of the best parts of Facebook’s Ad platform is that it’s set up in the same way you’d create your strategy: “What do I want?” “Who do I want to target?” “How much do I want to pay?” and “What do I want people to see in my ad?” This article will be structured the same way. Which of these 15 objectives you choose are, very much, going to depend on your business. Where are you in marketing and establishing yourself? For the purposes of this article, let’s say that I own a fashion retailer – SuaveSocks.com. SuaveSocks has one brick-and-mortar store based in Vancouver, BC and a distributor in Victoria, BC. We also has an active ecommerce strategy. We sell mid to high-end business socks for fashion-conscious men. I am looking to use Facebook Ads to drive traffic to my website and boost sales. If you want to drive sales with Facebook Ads, my recommendation is to first dip your toes with the Link Clicks objective. “Increase Conversions on your Website” requires you to install a conversion-tracking pixel on your site’s checkout page and is a bit more complicated than I’ll get into here. I’m not saying it’s difficult, or that you shouldn’t do it down the line, but for now let’s just stick with wrapping our heads around driving traffic with Facebook Ads. Ultimately, Facebook’s targeting ability is what allows it to compete with Google’s platform. Let’s be honest here. It’s tough to get around the fact that nobody on Facebook is actively searching for what you’re offering (like they are on Google). They give advertisers access to the frankly quite ridiculous amount of information they have on their users. Let’s say I wanted to run a Valentine’s day promotion to promote SuaveSocks exclusively to Facebook users (within my target market of male professionals) who have an upcoming birthday. I could do that. I could also target significant others who have a high-end credit card and whose anniversary is within 61-90 days. You’ll have to leave your unease at the door, here, folks. Facebook’s primary targeting capabilities revolve around location, age and gender – the simple stuff. 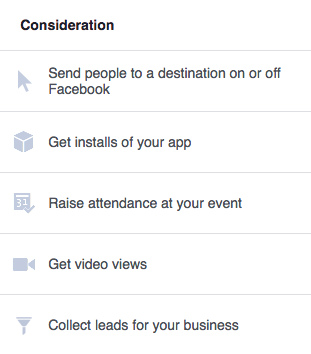 * Note: See the “Custom Audiences” option up there at the top of audience targeting? I’m not going to get into that in this article, as it goes a bit beyond simply driving traffic to your small business with Facebook Ads. However, custom audience targeting is an incredibly useful and powerful tool to have in your advertising arsenal. Once you’re done here, head over to Chapter 4 of my complete guide to Facebook Ads and learn all about it. Create an audience between 75,000 and 300,000. I know that’s a bit broad of a spectrum, but it’s really going to depend on your business and your target market. Try to keep it specific enough to exclusively reach people who might be interested in your product, but broad enough that Facebook’s low estimated click-through-rate will deliver a legitimate number of people to your site. Keep an eye on Facebook’s Estimated Daily Reach on the right side of the screen. This is based on both your ad audience’s size and your budget. 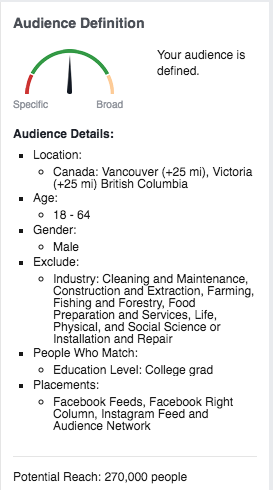 If I budget $40 for the ad audience I’ll get into below, I’ll reach about 12,000 Facebook and Instagram users. If my ad click through rate is 1% I’ll send 120 people to my site. If 10% of them convert at a purchase value of $20, I’ll be making $240 per day, giving me an ROI of (if I max my budget) of 500%. Not bad! My target market for this campaign is men (I would run a different ad campaign for those men’s girlfriends – one around Valentine’s Day would probably do pretty well). SuaveSocks retail for $15-25 per pair, so they’re relatively high end. They’re a fashion statement, so I’m going to be targeting men in the professional world (rather than blue-collar). I have two retail bases, one in Victoria, BC, and one in Vancouver, BC. As a result, I’ve set my location for 25 miles around both cities – this is what I’m comfortable delivering to in a reasonable timeframe. Rather than try to include every professional industry, I’ve chosen to select all college graduates, and then exclude men with blue-collar or outdoor careers. You’ve already seen a bit of the budgeting structure up there, but let’s get into it a bit more deeply. This is your hard-earned money, after all. 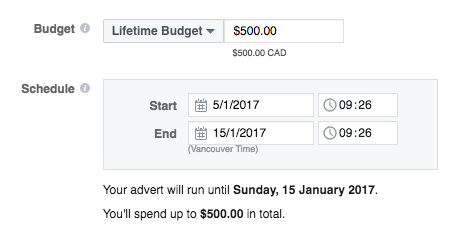 Facebook Ads are run based on either daily budget or lifetime budget. Those are pretty self-explanatory. Set start and end dates for all your campaigns (no matter which payment structure you’re going with). Your ads will be delivered based on your ad objective, your target audience, and your budget. For this first campaign, I’d recommend sticking with Facebook’s recommended delivery optimization – this is determined by your objective. 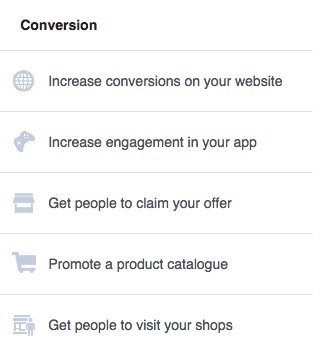 CPM (cost-per-mille): Pay when Facebook shows your ad to 1000 users, regardless of whether they engage or not. CPL (cost-per-like): Only available when your objective is “Page likes”, you pay per Like. CPA (cost-per-action): Pay when someone completes a specific action on your website (requires the Facebook conversion pixel). For small businesses this might be becoming a lead, starting a free trial or checking out from your ecommerce page. oCPM (optimized cost-per-mille): This is the same as CPM except Facebook puts more energy into targeting people more likely to click on your ad. The cost will be higher than default CPM. With this first campaign, I recommend you leave Facebook’s recommended/default cost structure as is (based on your chosen objective). You can always optimize down the line. As I said before, for this campaign I’ll keep Facebook’s recommended bid amount (automatic) and set cost structure to CPC. 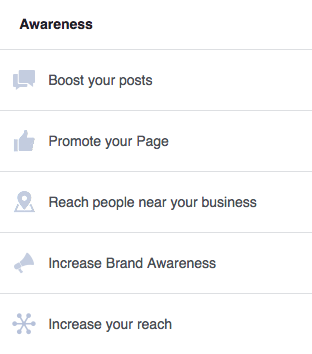 The main goal of your Facebook Ad is to stand out from the rest of the content on the site. When it comes to the Facebook newsfeed, that means standing out not just from the other ads, but from your target market’s nephew covered in spaghetti sauce, their best friend’s wedding, hilarious gifs of cats from Pages they’ve liked. Don’t skimp on resolution. Make your image clean, bright and obvious. Make your image simple – no small details. It should be easily understandable as your target audience scrolls. Use people’s faces. Humans are subconsciously attracted to the face. Avoid blue and white – the existing colors of the Facebook platform. Stand out with reds, yellows, greens, oranges. Consider a colorful border if the image is necessarily boring. If your product is an article of clothing or an accessory, put it on a model. Don’t devote more than 20% of your ad’s image to text. This is used to be a concrete rule, but Facebook has become a bit more lenient in the past year or so. Even so, it’s still a best practice. Check out Facebook’s image text check tool here if you’re curious about your image’s text allowance. Consider tying your campaign to a current event – something your target market is already thinking about: back-to-school, Valentine’s Day, the Superbowl, their birthday (Facebook’s targeting can do that), Dia de los Muertos, whatever. This will help combat the “I’m not thinking about that right now” aspect of Facebook Ads. Incentivize. Give people a reason to click. If you’re running a sale, make it clear what percentage people are getting off. If you’re giving away one product free with another purchase, make that word apparent (even caps). The border helps the ad to stand out, and the highlighted socks and brand name make it clear what the product is. The pink also appeals to the target market – fashion-conscious men. The headline “Want to stand out?” is a question the target market instinctively answers “yes” to. The value proposition of free shipping, a bonus pair and the ability to “be ready for the weekend” increases this promotion’s appeal. I’ve added the “Shop Now” CTA to tell the people who click exactly what they’re taking action on. No ambiguity in the advertising stage yields higher final conversion rates. How many of my visitors am I converting on my site or this campaign’s landing page?? What’s the value of those conversions after the drop off, bounce rate, etc? In order for me to be profitable with this campaign, what’s the most I can pay per click? This campaign, one of Wishpond’s, is driving people to our landing page product page. We’re paying about 45 cents per click. After we consider landing page conversion rates, signup rates and churn, this is still a very profitable campaign. We wouldn’t get that (or even 10 times that) with any other advertising platform. Your small business owes it to itself to try Facebook Ads. There’s no traffic-driving platform out there which is as affordable to test, nor a platform with more potential for optimization and success. This walkthrough provided you with all the basics of Facebook advertising, but there’s a lot more out there. My recommendation is to get rolling with your first campaign now and play around with the platform and $20 or $50. See what happens and go from there. And if you want to dive into the more advanced stuff (and that’s where we can really ramp up your ROI), check out our related reading below. I’d particularly recommend you install a conversion tracking pixel as soon as you can.